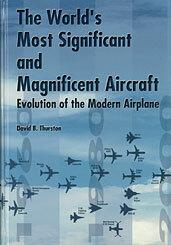 David B. Thurston - Thurston Aeromarine Corp.
Beginning with the earliest pre-flight designs, The World's Most Significant and Magnificent Aircraft provides exciting details of each plane's engineering, design, and flight accomplishments. Illustrated with pre-production diagrams and historical photos, the book is divided into seven parts representing the major stages of airplane development in a chronological order. If you do not have access to SAE MOBILUS via username/password or institutional access, you can still purchase the Book, The World's Most Significant and Magnificent Aircraft.